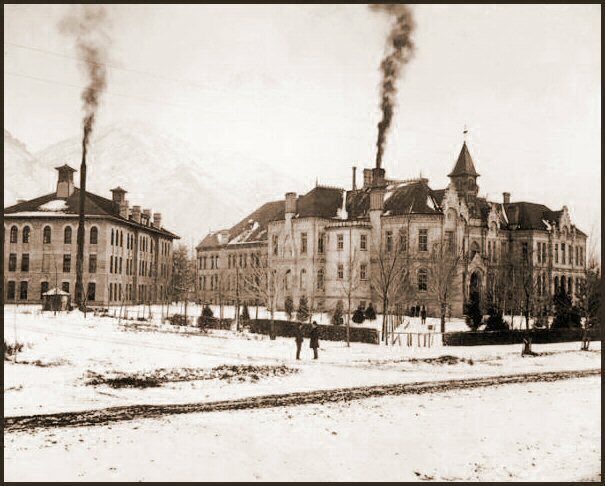 Brigham Young High School is a direct descendent of a private school, the Timpanogos Branch of the University of Deseret, which began in 1869 under the direction of Warren and Wilson Dusenberry. 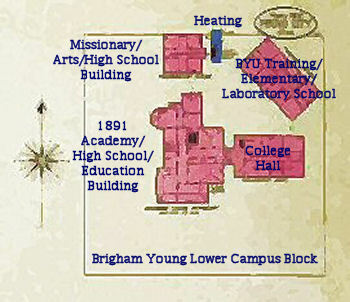 Property occupied by the Lewis Building, at Provo's Center Street and 300 West, was personally purchased by Brigham Young, who executed a deed on October 16, 1875, generally accepted as the founding date of Brigham Young Academy, Brigham Young High School, and Brigham Young University. Another early list included the names of 59 students, presumably in the 1876-1877 academic year. 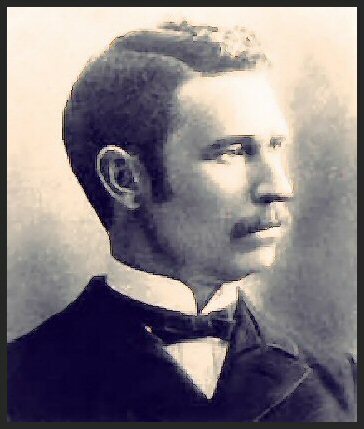 Warren Dusenberry's primary interest was to launch a school in Provo, and he agreed to serve as principal of the new Brigham Young Academy for only a few months until Karl G. Maeser, selected by Brigham Young to be the founding principal, arrived in April of 1876. Warren Dusenberry was a key member of the local legal community, an attorney, and soon thereafter became a judge. Karl G. Maeser, the founding principal of the private Brigham Young Academy, was born on January 16, 1828 in Saxony, Germany. He graduated with high honors from the Friedrichstadt Schullehrerseminar, a teacher-training college in Dresden, in May 1848. He worked as a teacher in Dresden, as a private tutor in Bohemia, and as vice-director of a school in Dresden. He married Anna Mieth, the school director's daughter, in 1854. Maeser first heard of the LDS Church through an anti-Mormon pamphlet. Rather than turning him away, it piqued his interest, and he wrote for more information. After some effort on his part, missionaries finally agreed to come to Dresden to teach him, and in October 1855 he was baptized. The LDS Church organized a branch in Dresden with the eight members, and Maeser was sustained as presiding elder. Like other Mormons, Maeser wanted to immigrate to "Zion" -- that is, Utah. Although he left Germany in 1856, he did not arrive in Utah until 1860. In the years between he served a church mission to Scotland, organized church branches and labored with Germans in the London area, worked in Philadelphia to earn money to go west, and served a mission in Virginia. After arriving in Utah, Maeser renewed his work as a teacher and school administrator. He helped organize schools in the Fifteenth and Twentieth wards in Salt Lake City and tutored Brigham Young's children; he also worked as Tabernacle organist and as an accountant. After serving a mission to Germany and Switzerland from 1867 to 1870, he taught briefly at the University of Deseret. He later returned to the Twentieth Ward Seminary. 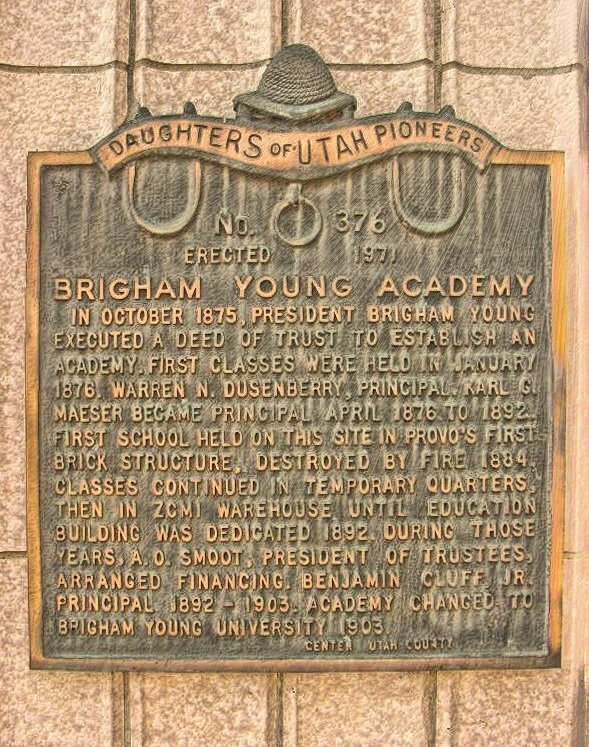 As already mentioned, in 1875 Brigham Young personally purchased the financially troubled branch of the University of Deseret in Provo and changed its name to Brigham Young Academy. In 1876 he asked Maeser to go to Provo to establish a church school, explaining, "Brother Maeser, I want you to remember that you ought not to teach even the alphabet or the multiplication tables without the Spirit of God." As Principal Maeser opened the school in April 1876 he observed: "There were no records, not much system, and certainly no regularity." He found the "premises inadequate, the facilities limited, students few in number and poorly prepared, and financial conditions exceedingly discouraging." In addition, as a private school, the Academy received little financial support from the LDS Church. Moreover, the dignified professor found liquor drinking and smoking and hoodlumism a considerable challenge. But he soon changed all that. School started precisely at 8:45 a.m., an unheard-of imposition up to that time. He instituted daily worship assemblies, graded the classes, demanded discipline and courtesy, inspired his students in their studies, and organized a "normal" class -- training teachers -- his specialty. Maeser met some opposition on his arrival but soon was acclaimed as the pupils became scholars and the school began turning out much-needed teachers. 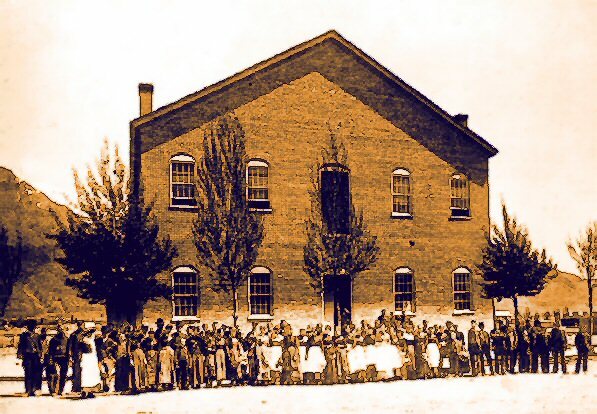 During the first sixteen years, Maeser struggled to build this school. Initially, he was not only the principal, but also the teacher, chorister, organist, janitor, recruiter, fund-raiser, and fan club. He took the school from a small student body of only twenty-nine students, who academically were only at the fifth-reader level, to an enrollment of more than 400 students in several high-school-level departments including the "normal" school. The first three students to graduate from BYA were Anna Kristina "Teenie" Smoot, Samuel Moore, and Carolina Ameilia "Caddie" Daniels (later Mills). They received their Normal diplomas from Principal Karl G. Maeser in June of 1877. An early group of students of Brigham Young Academy, circa 1877. Notice the high-wheel bicycle at left, and the boy, left, resting his foot on a mud scraper. Among the original faculty members of the Academy were Principal Maeser, Milton H. Hardy, John E. Booth, Anna Kristina Smoot, and Carolina Ameilia Daniels. 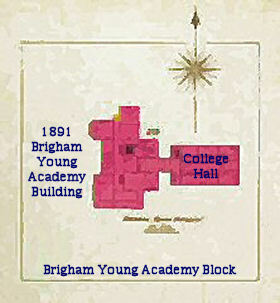 Under Maeser's direction, Brigham Young Academy added faculty and became one of the preeminent schools in the Utah Territory. Principal Maeser was able to successfully combine academic concerns, religious beliefs, and character development as part of the students' education. Maeser was appointed the first general superintendent of LDS Church schools in 1888, but he continued his responsibilities at Brigham Young Academy until January of 1892. 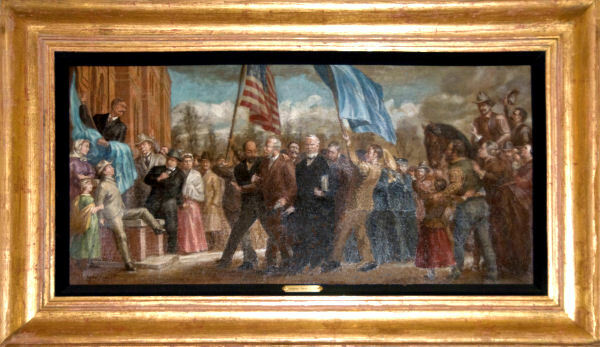 Like Moses leading his people to the promised land but not entering himself, Maeser never was an administrator or teacher in the new Academy building, but turned the reins over to his successor, Benjamin Cluff, at the dedication of the new facility in January of 1892. 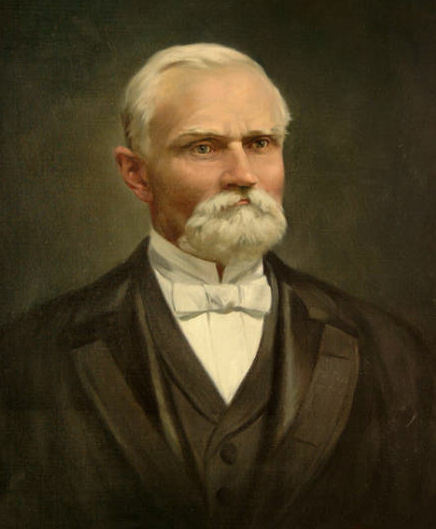 In 1889 the Church Board of Education honored Maeser by awarding him a degree of Doctor of Letters and Didactics. He was a frequent honored speaker at Academy events. He died in 1901. 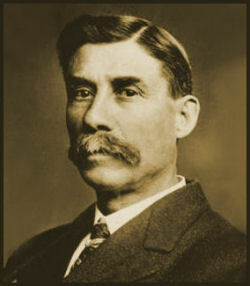 Abraham O. Smoot, Chairman of the Board of Trustees of Brigham Young Academy, was the indominable force behind the private Academy. He served first as mayor of Salt Lake City, then as mayor of Provo. His leadership involved almost every facet of the development of the whole territory and its rapidly expanding population. When Brigham Young, owner of the school, died in 1877, the leadership of BYA fell heavily on Smoot, acting as liaison between a dubious but hopeful public and an ambitious, driving leader in Karl G. Maeser. He gave his life and his fortune to build up the Academy. In his last days he assumed the debts of BYA amounting to more than $100,000. He mortgaged his properties and holdings to liquidate them. A wealthy man, he died practically penniless to save the honor of the Church and the school. 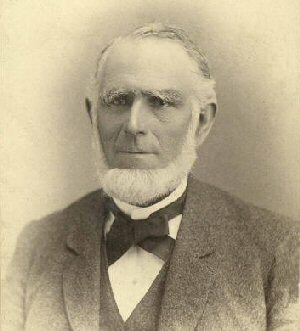 After he died on March 6, 1895 at the age of 80, over 5,000 people came to the Provo Tabernacle to pay honor to him. 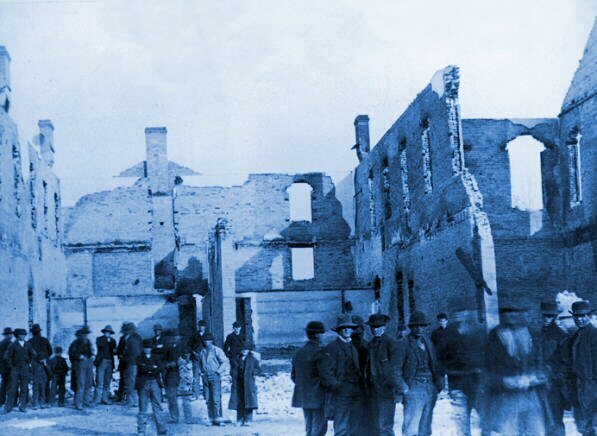 Lewis Hall burned in 1884. 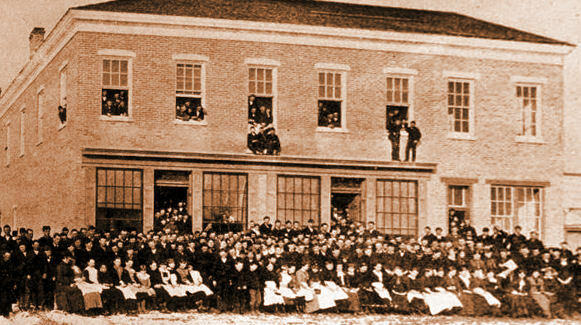 On a call from founder and principal Karl G. Maeser the following morning, faculty and students fitted up quarters in three temporary locations: a Provo meeting house, the First National bank in a business block completed by A. O. Smoot, and a new store belonging to Samuel Stephen Jones. During the summer, the ZCMI warehouse, located at the south end of University Avenue, was remodeled. School was held there until January, 1892, when the structure known as the High School Building, and later the Education Building, was completed. The plans for this new building had been drawn by architect Joseph Don Carlos Young, Brigham Young's son who was the first university-educated architectural engineer in Utah. He worked from a drawing submitted to him by Karl G. Maeser. Dr. Maeser had made the plans from a dream he had years earlier in which Brigham Young had appeared and escorted him through a spacious new building. BY Academy building was dedicated in 1892. Church and state officials from the entire territory were present on January 4, 1892, when it was dedicated. The famous photo shown above was taken at Founder's Day in 1900 (note the new 1898 College Hall addition standing behind the "High School" building). Located at the northern edge of the city, the large building was constructed of locally manufactured brick trimmed with sandstone and wood. The roof was composed of metal shingles. The large structure had 2 main floors, a basement and an attic. Room D, the Ballroom, was a large room used as a study hall and library as well for assemblies and occasionally for dancing. A portion of Room D housed the library until 1925, when the Heber J. Grant Library opened on the upper campus. Electricity generated from Abraham O. Smoot's sawmill two blocks to the west provided for electric lights in the building. Heating for a portion of the building was accomplished by forced air over steam radiators; the remaining rooms were heated by coal stoves. The Academy's bell tower had no bell until 1912. Up until then a triangle hanging in the main hall was struck to signal class changes. 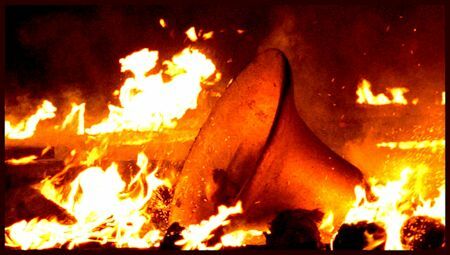 Unfortunately, the bell installed in 1912 was of poor manufacture and had a very dull sound. In 1919 the old Provo Tabernacle was razed and its nickel bell, cast by the McShane Bell Foundry in Baltimore in 1887, was installed at the Academy. It was removed in 1949 for repair. The belltower was again empty until 2000. The common name of the main "Academy Building", with "1891" engraved above the front doors, has changed several times. In 1898 it was renamed the "High School Building" when the new "College Hall" wing was added. In 1922 the name was changed again to "Education Building" -- the name it retained until the doors of B.Y. High were closed in 1968. Artist's depiction of the famous 1892 march. 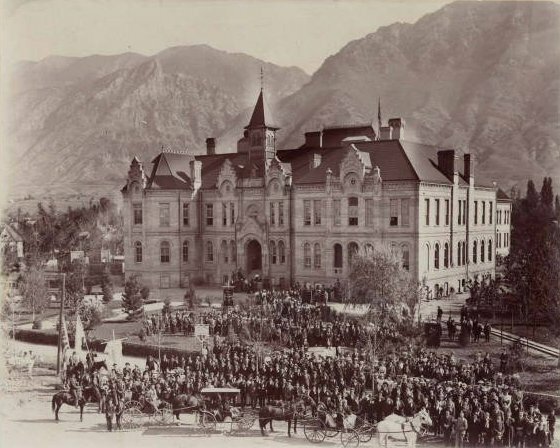 The year 1892 was a year of joy and sorrow: joy in January when the Academy's faculty, students and friends marched triumphantly from the old Lewis Building up Academy Avenue to the spacious new building; and sorrow when this historic ceremony marked the end of the administration of their beloved founder, Karl G. Maeser. However, a highly capable leader, Benjamin Cluff, Jr., had been called, and on this occasion was appointed principal to stand in place of the legendary Karl G. Maeser, and this brought additional joy to the Academy because Cluff, like Maeser, in the face of overwhelming obstacles refused to let the Academy die. In 1877, when 19-year-old Benjamin Cluff heard a glowing report about the fledgling Brigham Young Academy, the young town librarian of Coalville, Utah, set out almost immediately to walk the more than 60 miles from Coalville to Provo. This was the beginning of Cluff's association with the Academy that wouldn't end until after he had overseen its ascension to university status a quarter century later. His long walk was shortened when Cluff stopped overnight at his uncle's ranch between Park City and Kamas. That uncle, Harvey Cluff, happened to be a member of the Academy's board of trustees, and he gave his nephew a ride to Provo and introduced him to the school's legendary founder, Karl G. Maeser. Cluff slept under a stage during his first term as a BY Academy student. This is one of many examples of his strong desire for education. He was spiritually stalwart and throughout his life demonstrated nobility even during the most discouraging circumstances. He was an untiring fund-raiser who was initially told by the president of the LDS Church that the Church would not fund the operating budget of the Academy. Cluff's dedication to obtaining funding elsewhere set such a strong course for the school that eventually he began to convince Church leaders that the Church should provide significant on-going funding. The Academy's future would not be secure, Cluff realized, until the Church absorbed the school. 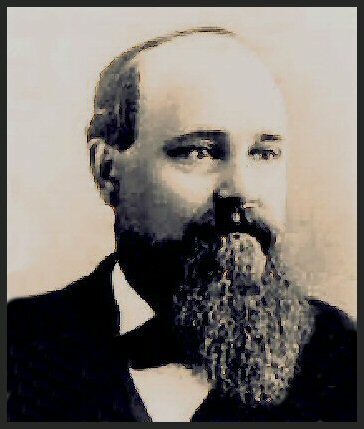 The succesor of A. O. Smoot as president of the Board of Directors was Apostle Brigham Young, Jr. Young informed Cluff at the end of the 1895-96 school year that the Church could not appropriate funds to the school for the upcoming year. Principal Cluff realized that if the Academy received no assistance from the Church, it meant the death of the institution. According to Cluff, one evening while he was returning from a walk down town, he was thinking deeply about the future of the Academy. Suddenly a thought came into his mind with the power of inspiration: "Give the school to the Church." Immediately, he said, his mind was at rest; he knew it was the right thing to do. Church leaders had invested so much energy in the Academy, that even the prospect of pushing the Church further into debt could not convince them to refuse Cluff's unsolicited gift. Twenty years after the founding of the Academy, the Church accepted the gift, prepared articles of incorporation dated July 18, 1896, and appropriated the funds needed to support the school. Now BYA was officially a subsidiary of the Church, which assumed responsibility for its future. Cluff expanded BYA's curriculum and helped acquire the future upper campus, added baseball and football to the school's activities, and brought prominent national speakers for guest lectures. The school almost certainly would not exist today without Benjamin Cluff's focused devotion, vision, sacrifice and inspiration. After leaving BYU at the end of 1903, he moved to Mexico, and then California. He died at Redondo Beach, California, in 1948. Additional outstanding leaders followed. 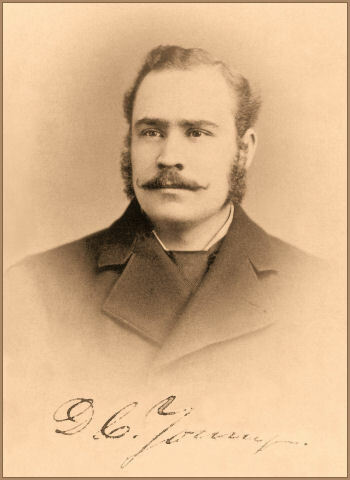 Principal Cluff's administration was followed by that of George H. Brimhall, who served as principal from 1895 to 1900 (and who later served as BYU President from 1904 to 1921). 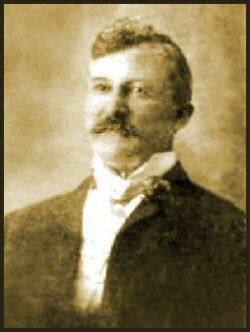 The capable principal from 1900 to 1904 was English professor Nels Lars Nelson. During the early decades, most students were elementary, middle and high school students. Men and women from 15 to 50 attended this Academy, a school designed to teach students who were mostly in the common or elementary school, and high school. The students in the kindergarten, the primary, and the intermediate grades were members of the elementary department of the Academy. Some of these elementary students were taught by older students of the Academy. Brigham Young Academy in its early stages was roughly the equivalent of a K through 12 school of today. Upon completion of their work, there was usually a examination, followed by commencement exercises. Students attended what terms they could, left for employment or go on missions, and sometimes returned to take additional classes. It was not until 1891 that a definite class organization for the Academy was effected in 1891 by Principal Maeser. Some students were able to take higher classes, and BYA began to award a few collegiate-level diplomas. The first one was given to James E. Talmage in 1881. In 1895 the High School, extant since 1876, was established as a separate department of the Academy. In 1896, the College Department was added. Funds were raised for a new wing, College Hall, which was dedicated at Commencement in 1898. 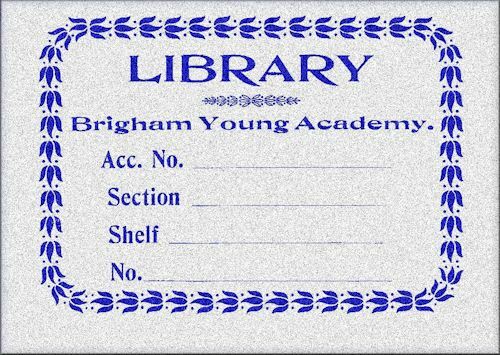 The modern era began in 1903, when Brigham Young Academy officially ceased to exist. It was replaced by two successor schools, Brigham Young High School and Brigham Young University. However, it was many years before University enrollment exceeded the High School enrollment. For example, in 1903-1904, the school had 14 faculty members, 825 high school students, and 74 collegiate students. This photograph shows the BYA campus in 1902, before the Missionary Training building (later called the Arts building) was constructed in 1903. Looking southeast from the northwest corner of what is now Academy Square, this photo shows the 1891 Education building on the right, the 1898 College Hall in the middle, and the 1902 Elementary School Training building on the left. In 1877, the second year of the Brigham Young Academy, music began to be offered to all of the grades � taught, interestingly, by the Academy principal himself, Karl G. Maeser. The 100-member student body soon enjoyed performances by the Academy choir at the weekly devotional. 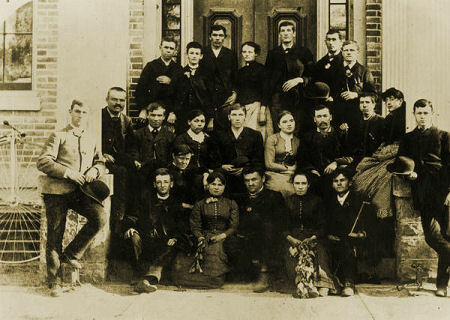 Two years later the faculty was augmented by a second teacher, Susa Young (Gates), the 22-year-old daughter of the school's namesake, Brigham Young. More teachers and new courses soon followed. After two building moves the department settled down in the ZCMI warehouse at 5th South and J Street. A course in harmony was taught by new faculty member Henry E. Giles, who used the Evan Stephens Music Reader as a text. By 1892 Brigham Young Academy enrollment had reached 275 with 16 teachers, and the new building was dedicated in January of 1893. Professor Giles conducted the musical program for the dedication. The new three-story building easily housed the Music Department which offered 7 courses: vocal music, voice culture, instrumental music (piano), harmony, theory, composition, and church organ music. In 1896 Professor Giles left the Academy to take a position as music supervisor for the Provo public schools, and was replaced by Anthony C. Lund, who was to guide the Music Department for the next 20 years. After graduating from Brigham Young Academy in 1891, Lund went on to study at the Royal Conservatory in Leipzig. Almost immediately upon taking over the helm of the BYA Music Department, Lund set about making improvements based on the conservatory model he had experienced in Germany. Albert Miller, a former member of a Dresden military band and a recent convert to the Church, was employed in 1901, and he started an orchestra and band program. Miller also taught violin and wind instruments. Very popular, his musicians were in great demand. Sadly, Professor Miller died suddenly of typhoid-pneumonia on January 31, 1906. The next prominent faculty addition was Claire William Reid, a Manti, Utah native who had followed his graduation from BY Academy with studies at the New England Conservatory. Because of growth, the Department of Music moved from the Academy to the adjacent College Hall building where it remained for the next 65 years. With 200 students and its programs of study expanding, the name of the Department of Music was changed in 1901 to the School of Music. The primary emphasis at the School of Music was to prepare music teachers for employment at the 22 Church-owned academies throughout the West, as well as at public schools throughout the state and region. While most graduates were high school graduates, additional university classes were added as needed.